Most scientists seem to be obsessed by size. The bigger and more dramatic something appears the better. This is particularly true in the world of health, where the obsession is with the big killers like cancer and heart conditions, while the stuff that bothers most of us on a day to day basis like the common cold or back pain is largely ignored. Health professionals only seem to be interested if there’s something really big wrong with us, if we’re just feeling a little under par we are routinely dismissed. Their attitude to disciplines like acupuncture that seek to rebalance the body with subtle manipulations of our chi force is at best patronising, but when it comes to something like homeopathy most of these so called scientists start frothing at the mouth. How can something so small have any affect at all is the stock response, conveniently forgetting that most diseases have really tiny causes. But all this size worship is nothing compared to that of astronomers and cosmologists. They are so consumed by their study of vast things billions of light years away, that they are completely unable to see what is right under their noses. They also forget that for every fascinating discovery made in their really big directions, there are equally interesting and challenging ones being made in the field of quantum mechanics, the world of infinitely small things. What is this obsession with size anyway ? Some might say its a compensation for a personal issue. Perhaps this applies to astrophysicist Brian Cox who has Mars in Aries but exactly conjunct Saturn which could also explain why he speaks in a high squeaky voice. Its been nearly a century since the atom was first split and half as long since the invention of the micro chip, so these scientists have had plenty of time to get used to the incredible power that is vested in the most minute things, but no. When it comes down to it, they regress to the school playground mentality and the ” my planet’s bigger than yours ” taunts. One of the most ridiculously stupid developments in astronomy over recent years has been the withdrawal of planetary status from Pluto and the person claiming to be responsible for this is Michael E Brown. Brown’s chart is pretty straightforward. Two stelliums, one in Gemini the other in Virgo make it fairly clear that this is someone for whom information gathering and analysis is the be all and end all. Unfortunately these days, an obsession with these tendencies has become confused with thinking and understanding. Capricorn Research has a collection of 737 charts of scientists and Gemini is the top scoring Sun sign with 138 % of the expected figure. Interestingly Sagittarius, the sign generally associated with wisdom and understanding is by far the lowest in this group with a mere 57 %. No doubt these scientists themselves would ignore this research despite the fact that by their own testing methods ( the p test ), the chances of these findings occurring by chance alone is 0.00016. Anything below the figure of 0.01 is accepted as a proven statistical link. For more information on this research see What Makes an Artist or a Scientist ? But even by these standards Mike Brown is a considerably bigger noise in the field of science than most of them. The Sun’s conjunction with Jupiter sees to that. Jupiter is the great exaggerator, it does everything on the grandest of scales. And Brown has this Sun / Jupiter conjunction at the apex of a T Square. Any planets at an apex will be very powerfully projected throughout the life of that person. An apex Sun is always someone with a very strong and dominant ego, particularly if Jupiter is involved. Good examples of this are Margaret Thatcher and Napoleon, but even they only had the apex Sun in square to Jupiter. Brown has the conjunction. For Mike Brown, its not simply a case of size matters, it’s more that nothing else does. Looking at the T square more closely we can see that its based on an extremely close square aspect between the Sun and Pluto. As always for people who gain a certain notoriety in their lives, their charts will point to the reasons for their fame. 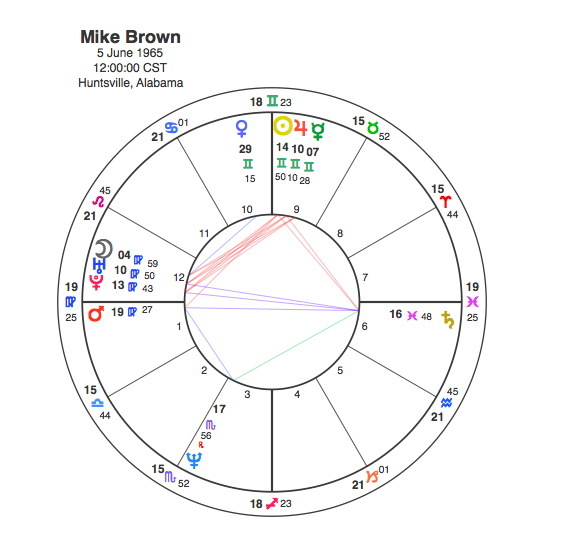 Since Brown’s biggest claim to fame seems to be as the man who ” killed ” Pluto, his chart symbolically reflects this nicely. Pluto is in the sign the underdog ( Virgo ) surrounded by the aggressive Mars and disruptive Uranus. Pluto is opposed by old father time himself, Saturn. So it does appear that Pluto is about to meet its end. An opposition in a T Square always creates a tension which is projected strongly onto any planets at the apex of the pattern. So the result of the violence to ( Mars / Uranus ) and the death ( Saturn ) of Pluto is the projection of the largest ego ( Sun / Jupiter apex ) in the world of science ( Gemini ). So we have Mike Brown going round telling everybody that he was the man who killed Pluto. The strange thing about this is that it is clear from his chart, so Pluto must in some way be complicit in its own demise. This is particularly true when we look into the transits of all this. Whenever Pluto is in aspect to the Sun, the powerful and dramatic change that is indicated is most likely to occur when Pluto makes its next major aspect to it. Because Brown’s chart contains close aspects with other planets that are obviously involved in this Pluto slaying, we have to treat the whole area between 10 degrees ( Jupiter and Uranus ) and 19. 30 degrees ( Mars ) of the Mutable signs as the sensitive area. Pluto has made one transit to these degrees since Mike Brown was born, between 1999 and 2004. During this time Brown became professor of planetary astronomy at the California Institute of Technology and also discovered a number of trans Neptunian objects, notably Quaoar in June 2002 and particularly Eris in October 2003. It was the discovery of Eris that was key because it was the only known TNO more massive than Pluto. Brown pushed for Pluto being downgraded to a dwarf planet in the aftermath of the discovery of Eris. So Pluto’s own transits were key in the discoveries that were to kill its own status. The key question for astrologers but also for the whole of humanity is why ? I have also come to the conclusion that astrology likes to work whilst the vast majority of its human targets on earth remain completely ignorant of this fact. If most people, particularly the power possessing beings, had astrological insight then they could use this foreknowledge to change things for their own ends which could well have disastrous consequences for life on earth and may even end up reducing the effectiveness of astrology itself. So while stoic souls like Capricorn Research spend large chunks of their life beavering away to try and prove astrology, I have to accept that the subject itself does not want to be revealed to all and sundry. And this reluctant fact is particularly true of Pluto. Pluto works best in the dark, in the shady areas of our unconscious steadily undermining things up to the point where it suddenly and unexpectedly bursts through to the surface, blowing everything to smithereens. The Grim Reaper would much rather creep up on its victim and viciously cut them down with its scythe, absolutely no point in giving them prior warning because then they would be out of there. So Pluto obviously decided that it was getting too much attention and publicity from astrologers which might interfere with the element of sheer shock that it likes to bring with it. Pluto therefore decided the best way to remain incognito would be to get its status downgraded to that of an inconsequential dwarf planet. And what better way to do this than to harness some information gatherer with an ego the size of Jupiter to be an unwitting pawn in its plan. For some people, like Mike Brown, size is everything. True scientists would withhold judgement on such affairs until the real impact of these things can be properly assessed and understood. Capricorn Research would be happy to accept Pluto’s dwarf status once it can be proved that the astrological impact of Eris and other similar newcomers exceeds its own. But anyone looking through the articles on this site would have to agree that’s never likely to happen. So Mike Brown will continue to vaunt his own ego, while the rest of us get on with proper scientific observation and testing. The only problem really is that since Pluto used its only transit to Brown’s T Square to promote him to a position where he could discover Eris and hand out dwarf status, it doesn’t have another chance to give him the kicking he so obviously deserves. Or at least not until the year 2055 anyway when its transit through mid Pisces gives it another opportunity. However a quick look at the ephemeris for 2016, does provide some consolation. There is one planet just about to create havoc in the middle of Mutable signs. Mike Brown will soon be wishing he’d killed Saturn rather than Pluto.